Oscar Pistorius apologises for the timing of his comments about the running blades used by T44 200 metres rival Alan Fonteles Oliveira, who beat the South African to the gold medal on Sunday. After losing the T4 200m in an astonishing final to Brazil’s Alan Oliveira, the South African claimed that length of the winner’s artificial limbs gave him an unfair advantage. Paralympic poster boy Pistorius was the favourite to win, but Brazil’s Alan Oliveira raced ahead in the final 60m, taking over from the South African to win gold in an incredible finish. Speaking after the race, Pistorius said that the Brazilian’s long legs, helped by longer artificial limbs, meant that it was not a “fair race”. He also hit out at the International Paralympic Committee (IPC) for failing to act over the length of some athletes’ blades. The statement continued: “I do believe that there is an issue here and I welcome the opportunity to discuss with the IPC but I accept that raising these concerns immediately as I stepped off the track was wrong. Pistorius added that he is happy to work with the IPC on the issue. The Brazilian took gold in 21.45 seconds, leaving Pistorius to settle for silver, coming home in 21.52 seconds with stunned quiet from the 80,000 spectators greeting the result. 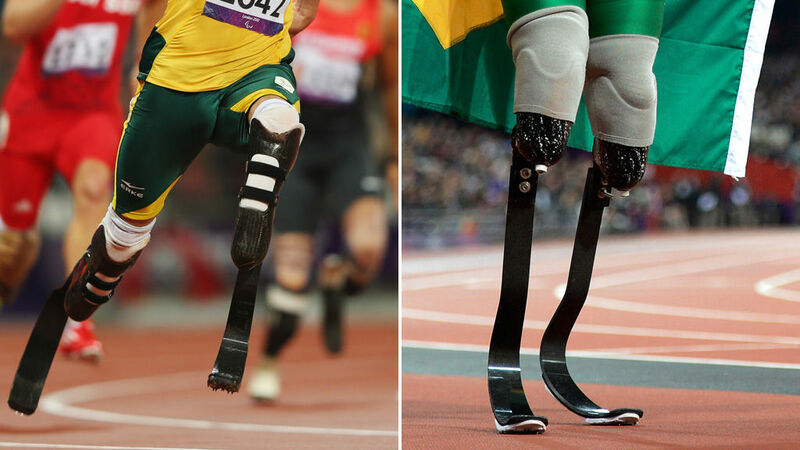 Responding to Pistorius’s claims, Oliveira said that the length of his blades had been approved by the IPC and that he had not changed them during the competition. The IPC have released a statement on the rules that in place regarding prosthetic blades and revealed that Pistorius had requested a meeting after last night’s race. The statement added: “Since 2010 athletes competing at IPC international competitions have been checked at regular occasions in the Call Room prior to participation. “At the London 2012 Paralympic Games all athletes competing in T42/43/44 events (above knee and below knee lower leg amputees) have had their prosthesis measured against the IPC Athletics Rules. “All athletes competing in the Men’s 200m T44 final were checked by international classifiers in the Call Room ahead of the race. All were within the regulations outlined in the IPC Athletics Classification Handbook. Pistorius beat the world record in his qualifying heat for the 200m, but he failed to run as fast on Sunday evening.